SAILING AHEAD: John D’Helin, Geelong MP Christine Couzens, Sport Minister John Eren, Stuart Dickson and Geelong deputy mayor Peter Murrihy announce the Summer of Sails. Geelong will host four Olympic-class World Championships during the 2020 Summer of Sailing following a recent announcement. 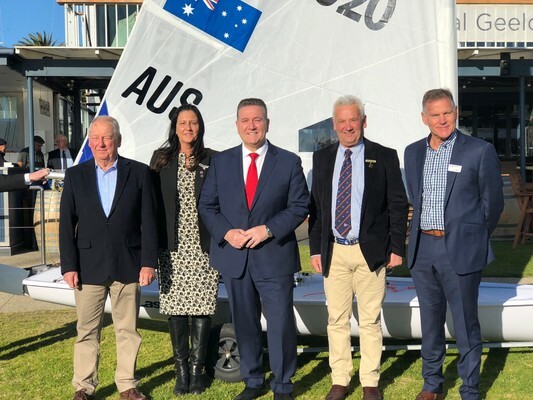 Victorian Sports Minister John Eren and Geelong MP Christine Couzens announced the event at Royal Geelong Yacht Club last Friday. Mr Eren expected the events expected to inject more than $4.6 million into the Victorian economy between February and March 2020. Royal Geelong Yacht Club Commodore John Kint welcomed the announcement of the event, which follow the Festival of Sails after the Australia Day long weekend. “It will be a massive year for the Royal Geelong Yacht Club and Geelong,“ he said. Almost 800 international and local competitors take to the waters of Corio Bay during the Summer of Sailing, he said. Sailors would compete in the event to qualify for the Tokyo Olympics in July 2020, Mr Kint said. The Summer of Sailing will include four Olympic sailing classes including the men’s and women’s 49er, Nacra World Championships, as well as the Laser Masters World Championship.